The IFRC paused on the third and final day of its General Assembly to reflect on and reward contributions made by individuals and National Societies working to serve humanity. 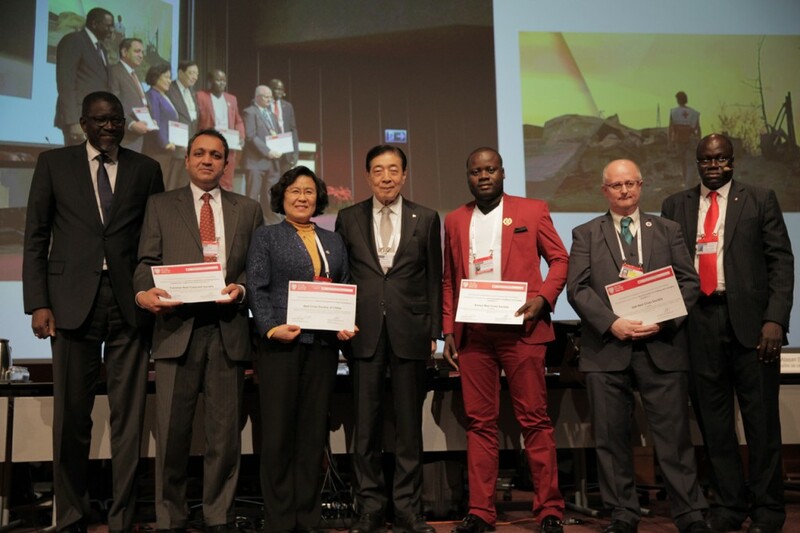 For the 2015 Volunteering Award, the Red Cross Society of China won for “volunteer management in urban environments”, the Pakistan Red Crescent Society was recognized for “volunteer mobilization and management in emergencies, fragile environments and crises”, while both the Irish Red Cross Society and Kenya Red Cross Society were awarded for the “use of innovation in mobilizing and managing volunteers”. 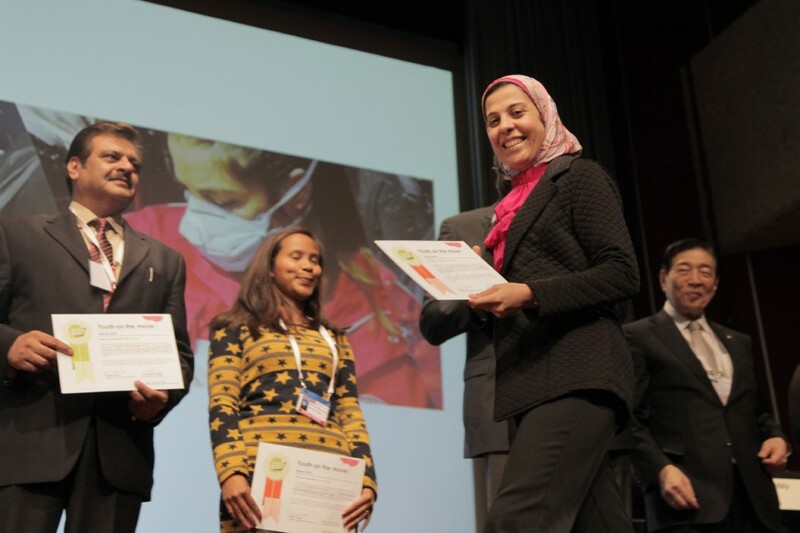 The Youth Award was granted to celebrate innovative initiatives by young people involved in humanitarian work, recognizing them as agents of change. 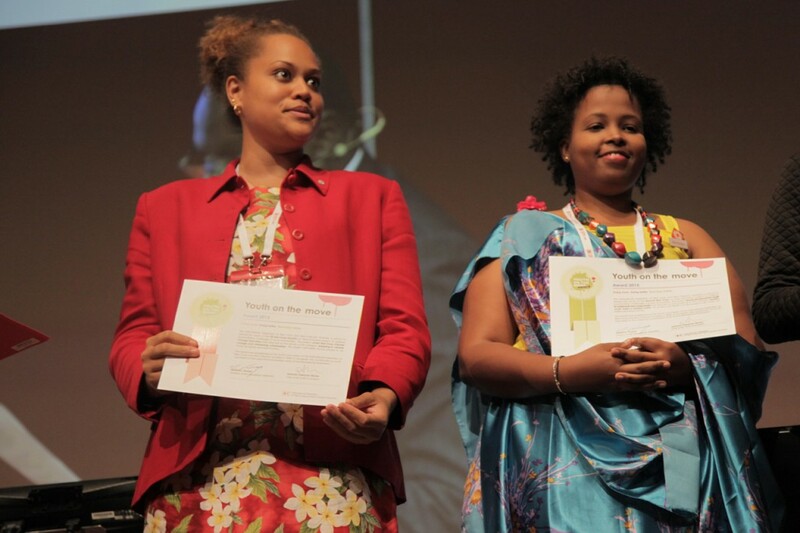 The award covered four categories and was given to the youth of the Malagasy Red Cross Society, the Egyptian Red Crescent Society, the Fiji Red Cross Society and the British Red Cross. 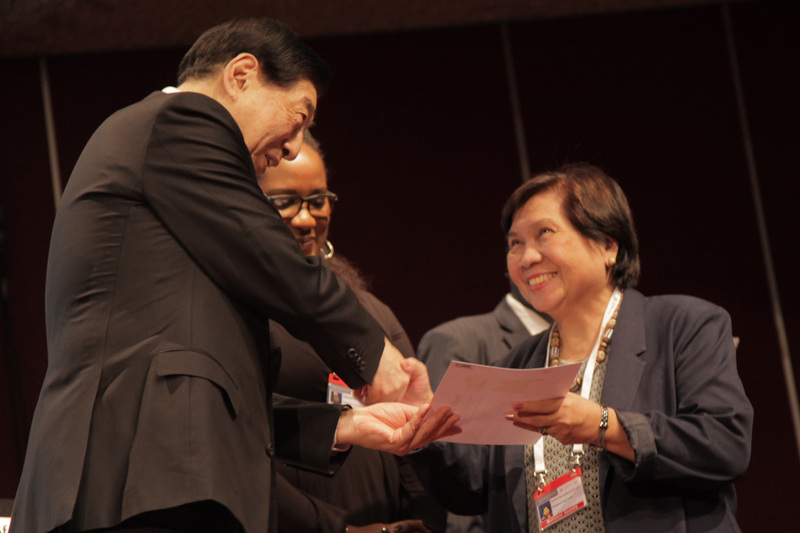 The Henry Davison Award, which is dedicated to National Societies or individuals who are working to serve the IFRC, National Societies and vulnerable communities, was given to three recipients. Mr. Paul Birech of Kenya was recognized for strengthening the capacity of Kenya Red Cross Society in responding to crises. The second recipient of the Henry Davison Award was Professor Aisha Youssef Al Mannai, PhD, who was nominated by the Qatar Red Crescent Society for promoting volunteering and humanitarian work. 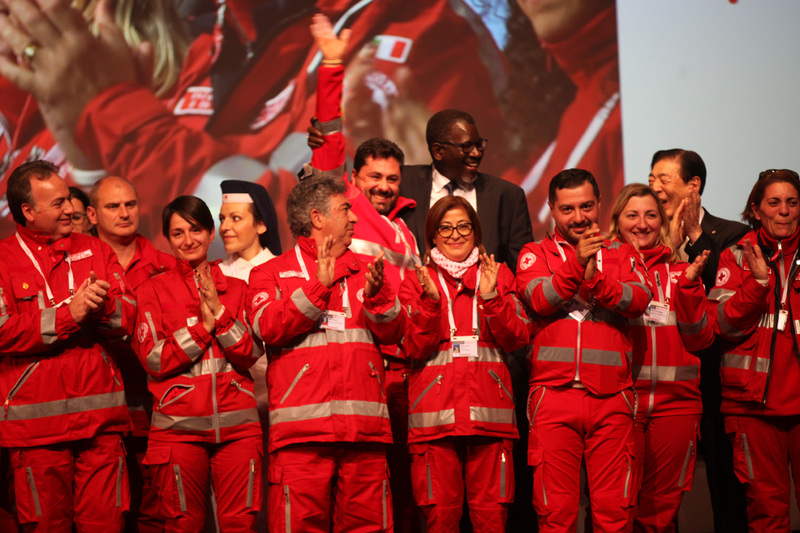 To a standing ovation and an emotional crowd, around 50 volunteers from the Sicily branch of the Italian Red Cross took to the stage in their red uniforms to accept the third Henry Davison Award. These volunteers were recognized for their dedicated and sympathetic response to the Mediterranean migration crisis, in harmony with IFRC’s campaign for the protection of migrants. The Red Cross Society of Georgia and the Red Cross of the Former Yugoslav Republic of Macedonia have become the first two National Societies to receive certification through the Organizational Capacity Assessment and Certification (OCAC) process. The general objective of OCAC is to enable National Societies to assess their own capacity and performance to determine the best approaches for their own self-development. It also acknowledges National Societies that have reached a high level of proficiency. There are two phases towards receiving certification. The first is self-assessment, followed by peer-to-peer review, with support from the International Federation of Red Cross and Red Crescent Societies (IFRC). 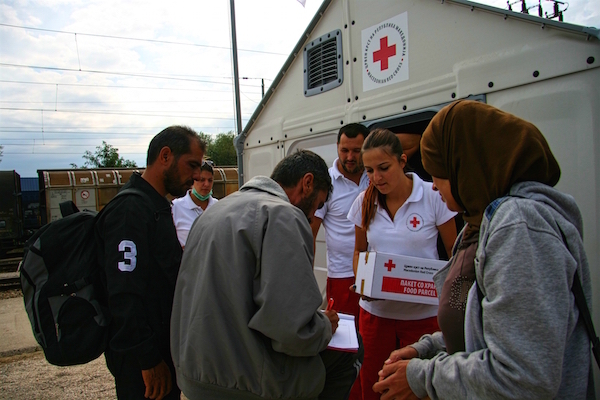 Volunteers from the Red Cross of the Former Yugoslav Republic of Macedonia have been vital in supporting people fleeing violence in Africa and the Middle East. The world is experiencing incredible changes, and one of the most remarkable is the mobilization taking place in the world’s population. For Professor Matt Baillie Smith of the University of Northumbria, co-author of the Global Review on Volunteering Report, this is one of the key challenges that the IFRC has to face to improve its performance in managing volunteers. The discussions took place during a side event titled “The power of Information Technology in strengthening volunteering/Trends in volunteering”, organized by British Red Cross and Spanish Red Cross. Maryanne Burton of the British Red Cross said that her National Society is exploring new ways to work with volunteers who want to give short periods of their time. “We cannot put them aside because they only have two or three days during the year to work with us – we have to be able to offer something to them,” she said. The Spanish Red Cross has been working hard to find different ways of volunteering using Information technology, and is implementing a virtual volunteer programme. “We use virtual volunteers to teach and entertain children in hospitals,” said Carlos Cortes. Ethiopian Red Cross is also innovating in volunteering. According to Dr. Solomon Ali, they partner with other organizations to improve volunteer training and deployment capacity. 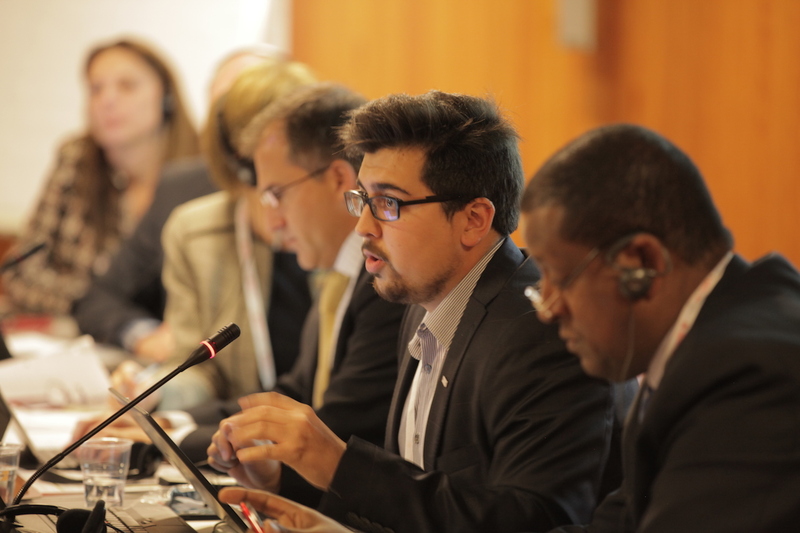 The Global Road Safety Partnership (GRSP) hosted a side event on the second day of the General Assembly to present and discuss the work of the IFRC and its member National Societies in promoting road safety. As traffic accidents have become among the leading causes of deaths and injuries in the world, the GRSP highlighted how National Red Cross and Red Crescent Societies can promote good practices and adopt approaches that can limit the number of these tragedies. The panel kicked off with a presentation on how road safety has become a major global concern, killing and injuring millions of people every year, and how the IFRC came to recognize the importance of this issue and integrate it in its programmes. The attendees then learned about initiatives and activities launched by the Turkish Red Crescent Society, the Mexican Red Cross and the Kazakh Red Crescent to promote road safety in their respective countries. Mr. Barry Watson, the CEO of GRSP, spoke of how many National Societies were able to use their position as auxiliary to Governments to push for the adoption of road safety laws, and praised their partnerships with local organizations. “Road safety has become integrated as a mainstream sector in National Red Cross and Red Crescent Societies,” he said. The IFRC first recognized road accidents as serious humanitarian disasters in its 1998 World Disaster Report and also highlighted the importance of addressing road crashes and related injuries and deaths in Strategy 2020. One of the most popular exhibits in the Humanitarian Village immediately transports visitors to a currently unfolding crisis. Donning virtual reality goggles, visitors find themselves in Serbia in the midst of thousands of migrants, making their way by foot, further into Europe. The virtual-reality technique allows people to see in 360 degrees everything going on around them – be it watching migrants as they walk by, a bakery where bread is handed out, or a reception centre on the border between Serbia and Croatia. “This technology, combined with the goggles, gives people a real empathetic sense of what it means to be on the migration trail with thousands of others, in the midst of the Ebola outbreak or the aftermath of an earthquake, or in a conflict zone,” said Shaun Hazeldine, Innovation lead at the IFRC. The Swedish Red Cross is leading the development of the technology, and Hazeldine explains that its benefits are potentially three-fold: it can be used to train delegates who are going to be deployed to the scene of an emergency to give them an accurate feel for what they will be experiencing; it can be used in various scenarios from tsunamis to conflict and epidemics, and it can be used for fundraising. National Society delegates visiting the exhibition will receive a cardboard version of the virtual reality goggles that can be used with a smartphone and downloadable app. 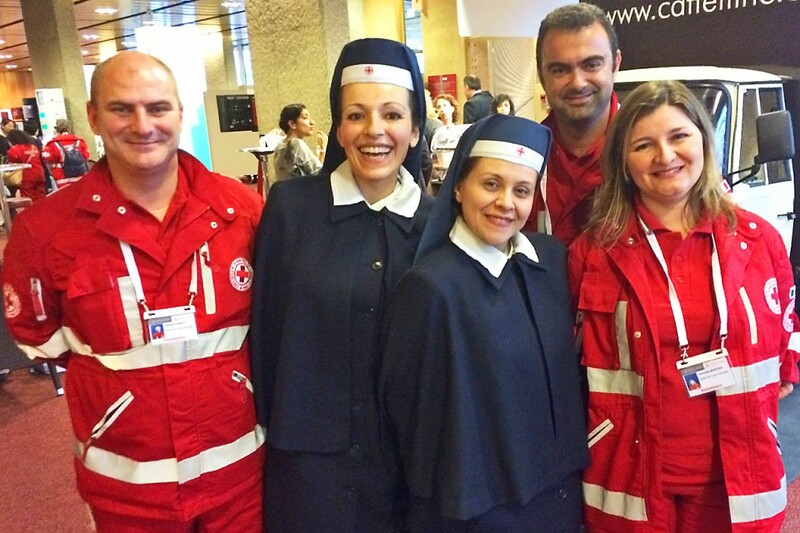 During the three days of the IFRC General Assembly, many National Societies signed up to use ammado, the IFRC’s online global donation and fundraising platform. 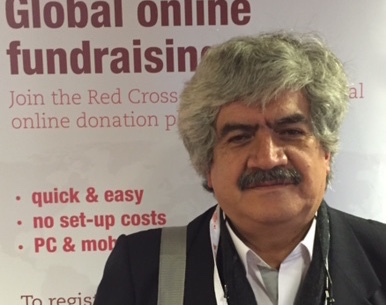 The Ecuadorian Red Cross, represented by Dr. Juan Cueva Ortega, President (left) became the 100th IFRC member to join the system, which lets National Societies join global fundraising campaigns, display their logo and receive all funds raised in their country as well as donor data. So far 114 Red Cross societies have joined the platform. The ammado stand is in the Humanitarian Village.